We take special pride in providing customers with more expertise and quality when it comes to lawn irrigation and sprinklers. We begin by walking your property, evaluating the type of soil, grass, flowers and shrubs, sun and shade exposure, ground slope, and all driveway, walkway, porch and patio areas. We then provide you with a personalized plan that details where irrigation will work best for your specific needs. Installation is scheduled around you and your contractors, minimizes sod disruption, avoids damaging roots and can even include drip irrigation directed into your planters, urns and window boxes. Every sprinkler system is programmed and pressure-tested, with proper water direction, flow, timing and spray patterns checked and certified effective. We’ll show you how your system will work before we leave, and show you how easy and convenient mobile phone control can be with the Rain Bird™ app. We only use Rain Bird™ Sprinkler heads and all copper backflows; they’re the industry’s best and come with a 5-year warranty. Plus, to ensure every property gets exactly the right amount of water and prevent needless waste—we always include Rain Bird RainSensors™ in our installations at no additional charge. Every new PINNACLE installation comes with our No-Worry Maintenance Plan for one year at no charge: free monitoring, free winterizing and free spring turn-on the first year—a $175 value. Each system monitors itself, with real-time alerts of any issues communicated wirelessly to our staff. Plus, we only use licensed plumbers to do hookup, at no additional cost, within 20 feet of any connection point. Adding an EZ-FLO Automatic Fertilizing System is the new and smarter way to fertilize your yard, shrubs, and flowers. Why? It avoids over fertilizing by “spoon feeding” your lawn and plants every time the system runs, by adding in micro-doses of fertilizer. As a result, it can dramatically enhance your lawn, shrubs, and flowers, reduce fertilizer needed by 70%-90%, and reduce water usage by 25%-50% as plants improve their root masses. Patented Micro-dosing technology developed over the last ten years feeds your landscape with tiny doses of nutrients that all plants can use—and eliminates the need, cost, and hassle of separate fertilizer applications or spreaders. As one of the only certified installers in the area, we’re happy to talk to you about it. Mobile Apps make sprinkler systems more convenient than ever—and provide easy control. 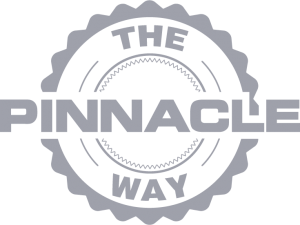 ALL THIS is the PINNACLE WAY. Interested in your property having a more beautiful lawn? We are too and we’re ready to help.